Offering you a complete choice of products which include pressure vessels. 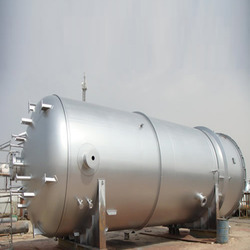 We are manufacturer and exporter of Pressure Vessels. Manufactured by our professionals in our advanced fabrication unit, our products are checked by our quality controllers on various parameters. We provide this range to our esteemed clients in various customized options as per their specific requirements. Clients can avail the offered range at reasonable prices.